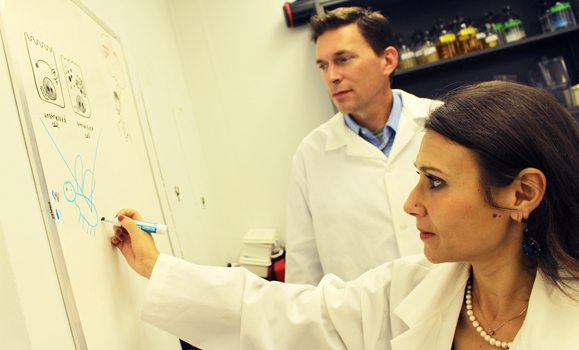 Dr. Craig McCormick and Dr. Francesca Di Cara. (Ryan McNutt photos). Immunology researcher Francesca Di Cara is settling into her new lab at Dalhousie Medical School, having arrived in early October from the University of Alberta. Apart from the weather, one of the main things that lured Dr. Di Cara to the east coast was the pending arrival of the ImageStreamX Mark II, cell-imaging and analysis equipment being purchased through Dalhousie Medical Research Foundation's 2018-19 Molly Appeal. “This is a very powerful scanning microscope that captures every single cell as it passes through, two million cells in a sample,” says Dr. Di Cara, who used an ImageStream at U of A to discover the on-off switch for the innate immune system. As an assistant professor in the Department of Microbiology & Immunology here at Dalhousie, Dr. Di Cara is looking forward to using the ImageStream to learn more about how the innate immune system is activated and provides us with our first line of defence against cancer cells, viruses, bacteria and other harmful invaders. Dr. Di Cara will be working closely with Dr. Craig McCormick, a professor in Microbiology & Immunology who studies how viruses such as herpes and influenza infect cells and replicate themselves. He and his team are looking for key events in the infection process they could target to create a powerful new generation of antiviral drugs. Drs. McCormick and Di Cara are part of a large collaborative of more than 30 Dalhousie Medical School researchers who will benefit from this year’s Dalhousie Medical Research Foundation Molly Appeal funding to purchase the ImageStreamX Mark II. These researchers are working together to understand the mechanisms of cancer, infectious diseases, inflammation and autoimmune disease, and how the immune system can be primed to fight disease better. In addition to raising funds for the ImageStream cell analysis equipment, this fall’s DMRF Molly Appeal will also support the launch of the Dalhousie Genome Informatics Training Program. This graduate-level training program will develop a new generation of medical researchers with combined expertise in biology and computer informatics. The new training program—which involves the faculties of Medicine, Science, Agriculture and Computer Science—will build on Dalhousie’s world-leading expertise in the development and application of computational methods for analyzing genetic data. Taken together, the equipment and training program being funded by this year’s DMRF Molly Appeal will provide medical researchers in the Maritimes with powerful methods of advancing their efforts to understand, diagnose, treat and prevent a wide range of diseases affecting tens of thousands of people in the region. Visit here for more information or to give to the Molly Appeal.